The Ryzex Group. As an immigrant living in Vancouver, British Columbia, Browne had relatively no business connections and no ability to raise capital. Despite these circumstances, Browne worked on his business from his small apartment. 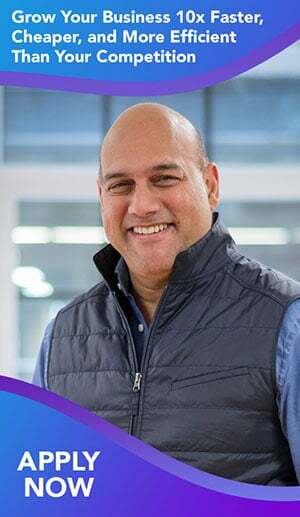 Using just $30,000 of his own money as starting capital, he built Ryzex into an innovative and highly successful multinational mobile technology solutions company. Browne was able to grow it to $75 million in 2007, with 360 people employed in offices spread around the world. 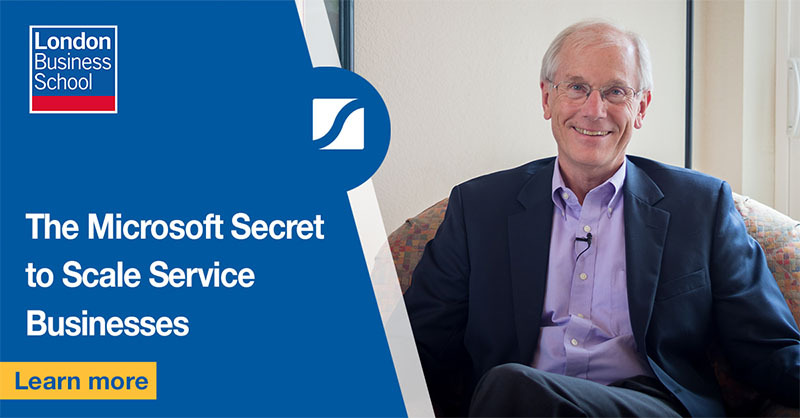 How did Browne, with limited capital and business connections, build Ryzex into a multi-million dollar business with operations in the U.S., Canada, Australia, the U.K., and France? 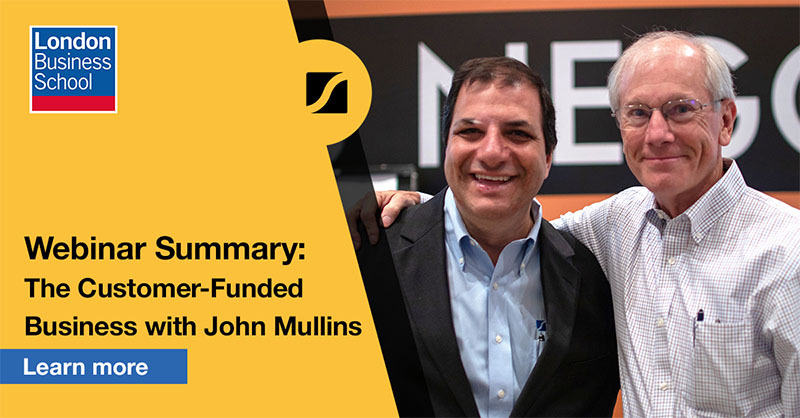 To find out, I invited Rud to join me and John Mullins in our recent Business Growth Lab webinar training on customer-funded models. 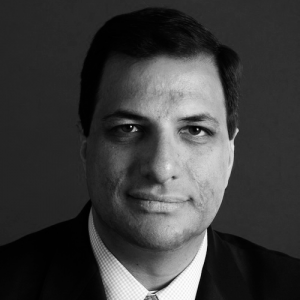 As you probably already know, John is an associate professor at London Business School and author of “The Customer-Funded Business”. 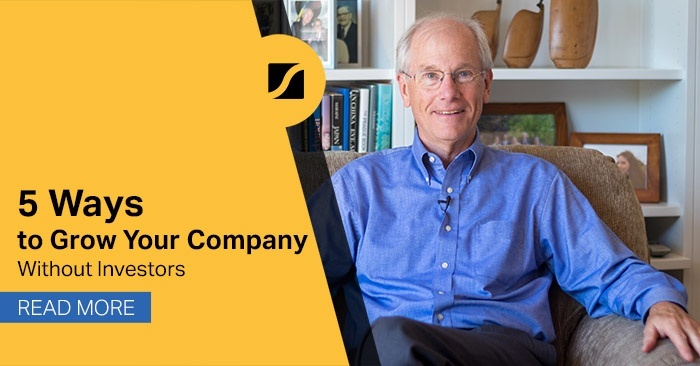 From John’s extensive research studying growth-minded entrepreneurs and business leaders, Rud Browne stands out as one of John’s favorite role models who exemplifies the use of customer-funded models. In this article, I’m going to recap my chat with John and Rud and show you how he applied customer-funded models to not just grow Ryzex, but help it survive through rough times. When Browne started Ryzex, it was based on the insight of one observation: Established companies that wanted to expand — whether that be adding another few trucks or opening new stores — generally wanted to buy exactly the kind of mobile devices they already were using. This is because their current systems and software have already been built around a particular technology platform. Often times however, those devices were no longer being made. Based on this insight, Ryzex’s business model focused on buying decommissioned mobile-computing equipment that was sitting in warehouses, gathering dust. Ryzex then refurbished and sold them to businesses that needed to expand their existing fleets or stores. Usually, buying and selling goods — especially technology-based goods — would require large amounts of capital to build up an inventory. Not having the capital to do so, Browne applied the pay-in-advance model instead. By doing so, he could use his customers’ cash to buy the inventory they ordered. With pay-in-advance at the center of his business model, Browne put all his focus on selling his products first. He would convince his customers to pay upfront. Simultaneously, he negotiated 60-90 day payment terms with his vendors. This gave Browne a window between the day his customers paid him and the day he needed to pay his vendors. During that window, Browne could use this cash to fund his business growth. Using this model, he ended up growing Ryzex for ten years at an average rate of 40% percent per annum or more. Over the 23 years he owned the company, the entire sum of money Browne invested into Ryzex was just $30,000. Initially, Ryzex enjoyed a relatively uncrowded niche. They were one of the first companies to recycle and reuse the type of equipment they focused on. Then, the arrival of the internet put pressure on margins. Additionally, migration to larger corporate customers and the sale of new equipment put pressure on Ryzex’s pay-in-advance terms. That was when, according to Browne, they “took the lazy way out”. 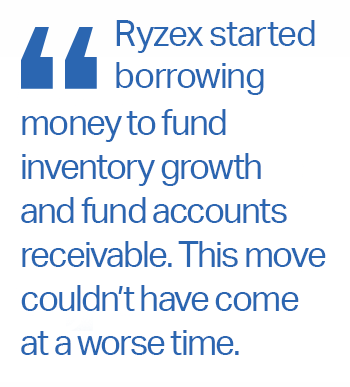 Ryzex started borrowing money to fund inventory growth and fund accounts receivable. The move to rely on external funding couldn’t have come at a worse time. When the financial crisis of 2008 hit, Ryzex suffered within 90 days. They experienced a 25% growth drop in revenues and within six months, their gross profit dropped 50%. Ryzex went from making a considerable amount of money every year to losing millions of dollars. Plummeting sales and declining margins left them with a $3.5 million debt. The bank was threatening to cut their credit lines, and they ultimately did cut Ryzex’s credit lines and called the loan on the building Browne had built to house the company. The global financial crisis was, for Ryzex, a crisis indeed. 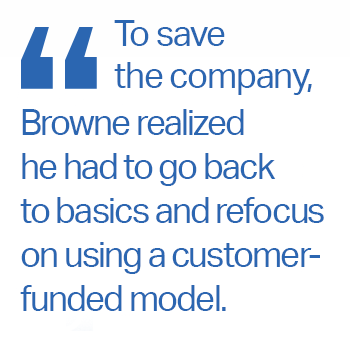 To save the company, Browne realized he had to go back to basics and refocus on using a customer funded model. 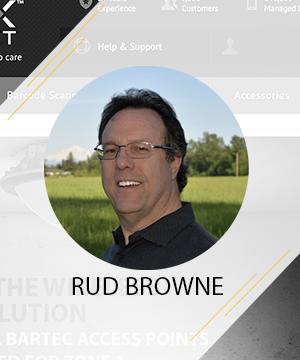 Rud Browne went into high gear and became very aggressive in reimplementing a customer-funded model. Personally training each and every one of his 360 employees on the importance of cash flow, Browne made managing cash everybody’s job. "On the customer side, there was no single bullet,” recalls Browne. Managing cash could mean anything from getting longer payment terms from its vendors or faster payment from its customers. Ryzex ramped up its sales of one-year service and maintenance contracts paid in advance, instead of monthly in arrears. It also ramped up sales of vendor-provided service contracts, for which Ryzex needed no investment in parts — inventory that may take 12 months to turn, thereby further conserving precious cash. While everyone in the industry felt tremendous pressure to accept every purchase order, Ryzex remained disciplined and simply refused to extend credit to customers it deemed financially risky. 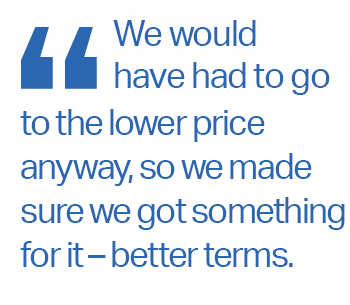 “We’d rather take a hit to our sales than have them go belly-up,” says Browne. Internal resistance to this policy evaporated when, after having insisted on prepayment, Ryzex avoided losing $1 million when one customer went bankrupt a week after the goods were delivered. Ryzex encouraged its customers, many of which were also cash starved, to use equipment leasing to finance large purchases. The leasing companies would pay Ryzex in 72 hours. Ryzex would pay its vendors (within agreed terms) 45 to 60 days later. Ryzex even began printing its invoices on garish, bright-green paper. “It’s the ugly green one,” its accounts receivables clerks would say to their customers when they claimed they couldn’t find the Ryzex invoice. Despite a 25% drop in sales and a 50% drop in margin dollars as the recession deepened, by applying these customer-funded strategies, Ryzex went from having $3.5 million in debt to a $6.5 million cash surplus in just 17 months. 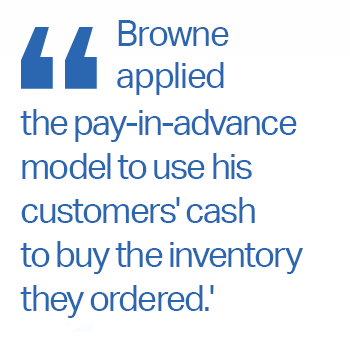 Browne is certain that if he had not returned to the customer-funded model, he would have lost the business. By going back to the customer-funded model of Ryzex’s early years, Browne took the company from a $3.5 million debt to having $6.5 million cash in surplus, a $10 million swing within one and a half years. on customer-funded models that solve your customers’ problems and unmet needs, rather than on raising money from investors.